AdDuplex has released another report for the May month and it has some really good news for Microsoft. 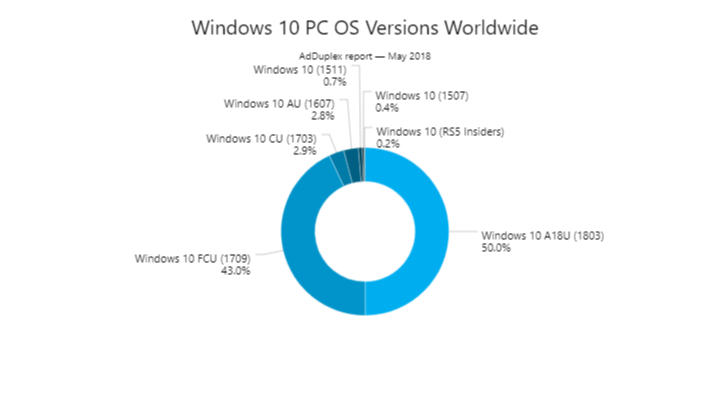 The latest report points at 50% adoption of Windows 10 April 2018 Update. The number is great considering the fact that April 2018 Update was released just a month back. Apart from this, AdDuplex also shared numbers related to April 2018 Update adoption by different OEMs. As per the report, Microsoft, Dell, and MSI are leading followed by Medion who is at 50% mark. Acer and Toshiba are notably behind the global average with just 38% of the devices running Windows 10 April 2018 Update. AdDuplex also the adoption percentage of different Surface devices. Here, Surface Book and Surface Pro 3 are leading the race with 70% followed by Surface Pro 4 at 65%. Unfortunately, Surface 3 is at the bottom with just 17% installation of April 2018 Update. This month’s numbers sure does show the fast adoption rate of Windows 10 April 2018 Update among the users. What do our readers think of this? Share your thoughts in the comments section below.